MELBOURNE: SP Setia, Malaysia's largest property development company will make its debut in the Australian property market with the Fultan LN, a mixed development project with a gross development value of A$470 million (A$1=RM3.20). Chief executive officer of Setia Melbourne Development Company Pty Ltd, Choong Kai Wai, said the property project, comprising 730 apartments as well as new commercial and retail units would be located at the Melbourne Central Business District (CBD) here. "Standing at 107 metres tall with 28 storeys, at the site linking Franklin and A'Beckett Street, it is the largest remaining undeveloped site in the central spine of the Melbourne CBD," Choong said during a media familiarisation tour of the Melbourne CBD recently. Work on the project, covering a site measuring 4,340 square metres, is expected to begin next year with completion due middle of 2014. The Fultan LN, apart from being a short walk to the Melbourne Central Shopping Centre and railway station, would be also close to the Royal Melbourne Institute of Technology, La Trobe University and Queen Victoria Market. A preview of the first phase of the property in Malaysia will be held by June 24, he said. The first phase will comprise 300 units of apartments with a gross development value of A$200 million. Already there are 600 potential takers for the property, said Choong. "We expect more interest in the property with the coming preview and the scheduled launch in early September in both Malaysia and Melbourne," he said. Choong also said the commercial units on the ground floor will not be for sale at the moment, explaining that it will be better for the developer to keep retail ownership in order to ensure control over the type of commercial or tenant mix to ensure sustainability to the development. However, he added that the commercial units may be sold at a later date when development is matured. "Our selling point is design, location and you get a piece of Melbourne," he said. The property's architecture was done by acclaimed Australian architect Karl Fender. On the property, he said it would offer "one one, two and three bedroom dwellings, a green pergola, communal garden, gymnasium, pool and roof terrace with theatrette and communal entertaining kitchen and dining space inspired by Adam D'Sylva, the famous chef in Melbourne." Choong said SP Setia was also committed to a number of Environmentally Sustainable Building design initiatives to achieve a Green Four Star Certified Rating which incorporates bicycle facilities, grey-water recycling, water tank, natural ventilation, green wall and good energy rating. Prices for the Fultan LN properties start from A$370,000 for a one-bedroom apartment, while two-bedroom apartments would start from A$515,000 and three-bedroom apartments from A$1.05 million. "At the moment, we are looking at substantial amount of financing from banks who could give us the most competitive rates," he said, adding that this will be finalised soon. Choong said SP Setia was in Australia for the long haul and was keen on property development in Melbourne and Sydney. PETALING JAYA: Last Wednesday marked UOA Development Bhd's debut on the Main Market of Bursa Malaysia. Year-to-date, the property developer's initial public offering (IPO) was the largest such exercise in South-East Asia. Based on the IPO's institutional price of RM2.60 per share, UOA Development has a market capitalisation of RM3.1bil, which makes it among the five largest property developers listed on Bursa Malaysia, together with UEM Land Bhd, SP Setia Bhd, IJM Land Bhd and IGB Corp Bhd. 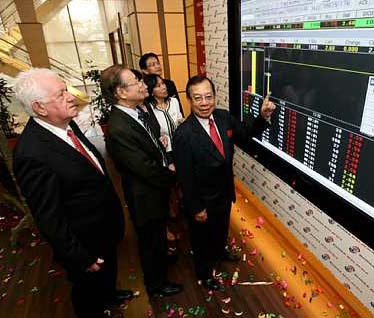 UOA is also listed on the Singapore Stock Exchange (SGX) in 2008, while its associate company, UOA Real Estate Investment Trust (UOA REIT), was listed on the Main Market of Bursa Malaysia in 2005. UOA Development is known as a fully integrated property developer with in-house capabilities in project conceptualisation and design, construction as well as sales and marketing. UOA Development's property launches in the second half of this year include One @ Bukit Ceylon Hotel Suites, which consists of 354 units located on a freehold 1,566 sq m site off Jalan Ceylon, Kuala Lumpur, and Kiara IV, which is a freehold residential project with 80 units on a 39,700 sq m site in Bukit Segambut, Kuala Lumpur. Both projects, due to be completed in 2013, have a combined GDV of RM400mil. In a recent StarBiz interview, UOA Development director Alan Charles Winduss pointed out that the company's integrated operation model had helped it to remain competitive and also mitigate rising land costs to a degree. As at Dec 31, 2010, UOA Develop-ment had a total saleable and lettable area of more than 300,000 sq m of properties under development with a gross development value GDV) of RM2bil to be completed over the next three years. For financial year 2010 (FY10), UOA Development posted a net profit of RM285.8mil on revenue of RM375.2mil. For the first quarter of this year, the company posted a net profit of RM130mil on the back of revenue of RM145.7mil. However, it should be noted that in its profit calculation for the quarter under review, the company also recognised fair value gains amounting to RM92.3mil (which was not included as revenue for the quarter) due to the completion of Blocks 3 and 4 of The Horizon Phase II which are held as investment properties in the flagship Bangsar South City development. Prior to UOA Development's listing, many research analysts were quite bullish about the shares' prospects as they said the company had solid fundamentals with a strong parent in UOA, prime landbank in strategic locations in the Klang Valley, and reasonably high margins attributable to its in-house construction and procurement unit. Several research firms accorded fair values in the RM3.50 range for the share prior to listing. However, the company's lacklustre debut on Bursa Malaysia left investors disappointed and analysts puzzled. The stock touched a high of only RM2.62 on its first day of trade, and ended at RM2.52 as at last Friday, down 3.1% from its initial public offering (IPO) institutional price of RM2.60 per share. The volume traded last week was 82.5 million shares, with some 78 million shares changing hands on Wednesday but only about 4.5 million shares on Thursday and Friday. In a filing with Bursa Malaysia, UOA also raised its stake in UOA Development to 66.58% or 796.15 million shares by acquiring shares in the open market last Wednesday. One analyst from a local research firm said investors' perceptions might have been affected by the share's low 5 sen par value against its offer price, as well as the flat performance on the local bourse last week. Another analyst pointed out generally, investors preferred property stocks with more diversified township developments and were perhaps unhappy that UOA Development was mainly renowned for its ongoing 60-acre Bangsar South City project in Kampung Kerinchi, Kuala Lumpur. Kenanga Research said in a IPO note last month that there was “single” area concentration risks for the company as the bulk of its projects were in Bangsar South City while the property sector's risks included negative real-estate policies, rising interest rates, tightening banking system liquidity and an economic slowdown. A note issued by ECM Libra Investment Research last month said the company was also overly exposed to non-residential properties which accounted for 86% of its remaining GDV. However, the company's chief operating officer (development division) David Khor said recently he hoped the ratio would change in the next two years, with higher volume contribution from residential projects. As part of this strategy, the company announced last week, in a Bursa Malaysia filing, that its wholly-owned subsidiary, Magna Tiara Development Sdn Bhd, had entered into a conditional sale-and-purchase agreement with Sim Nam Housing Development Co Sdn Bhd to acquire two parcels of freehold land measuring 4.86 acres in Sri Petaling, Kuala Lumpur, for RM50mil cash from internally-generated funds. The company plans to build a high-rise residential development on the site, located 15km from Kuala Lumpur City Centre, with a launch slated in the fourth quarter of this year. KUALA LUMPUR: SIME DARBY BHD’s healthcare division is investing RM280 million in two hospital projects in the Klang Valley as part of the government’s health tourism plan under the Economic Transformation Programme (ETP). The conglomerate said on Monday, June 13 it would invest in a 220-bed Sime Darby Medical Centre Ara Damansara in Subang which will be operational by the third quarter of 2011. The 300-bed Sime Darby Medical Centre ParkCity will be operational by the second half of 2012. Sime Darby’s investment in the two hospitals is part of the Entry Point Project 4 under the Economic Transformation Programme. “To achieve this target, the healthcare sector will require an additional 1,900 beds. The bulk of the investment required to achieve this target is expected to come from the private sector,” it said. Under the EPP 4, the target is to attract two million people under the health tourism programme.